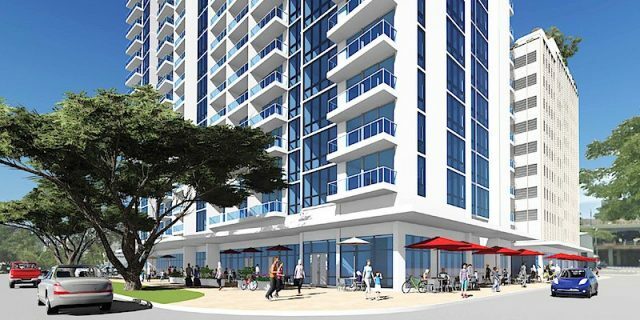 If you are looking for a spacious, affordable, centrally-located new development condo in Honolulu with great amenities and efficient high-tech appliances, The Central Ala Moana will be a great option for you. 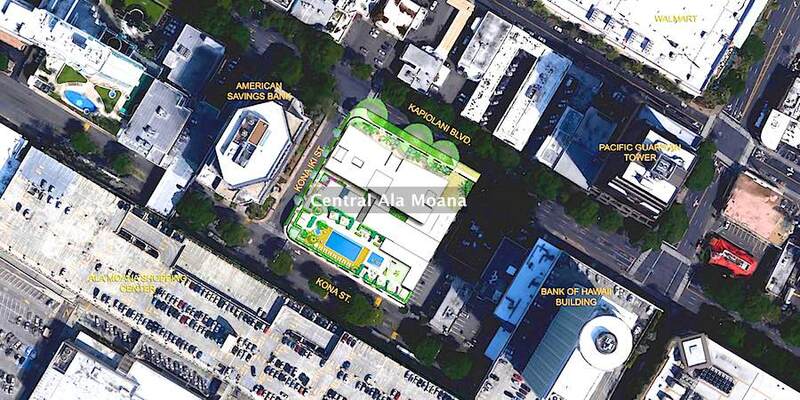 The Central Ala Moana offers 202 market rate units and 310 affordable housing units. This spacious development project offers great opportunities for both investors and the eligible Hawaii residents in accordance with the guidelines of The Hawaii Housing Finance and Development Corporation (HHFDC) for affordable housing. The information provided in this blog can also be found at The Central Ala Moana website. It should be noted that all figures, facts, information and prices provided are estimate and subject to change at any time. For more info, contact Sunny Bak (RA) by texting (808) 753-8293 or emailing at Sunny@HawaiiLiving.com for further information and assistance. Application Deadline for Market rate is December 11, 2018 and you must submit signed owner occupant affidavit with pre-qualification letter. However, Good news for investors is that the developer got a waiver from the city that any buyer of a market rate unit may put the unit on market or rent it out 1 day after taking the ownership of the unit. Application Deadline for Affordable is January 14, 2019 and you must submit application package in person with pre-qualification letter from the developer’s preferred lenders. Once unit is selected, buyer must bring a $500 deposit at signing and the remaining of 5% after 30 days. 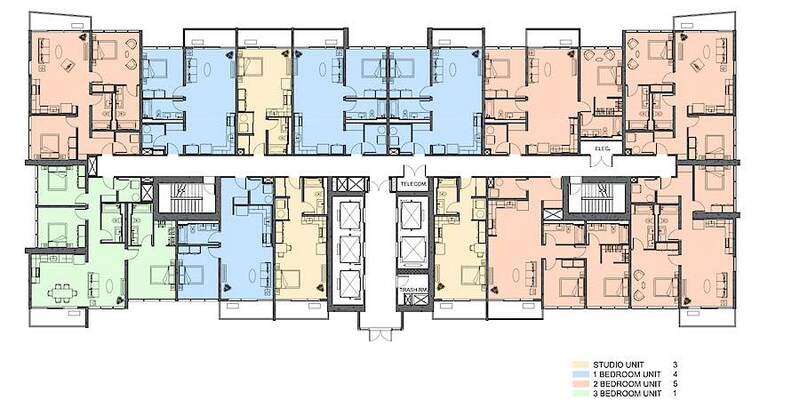 Each residential floor will have a total of 13 units (3 Studio, 4 One-bed, 5 Two-bedrooms, and 1 Three-bedroom units). There is detached parking structure from 2nd to 10th floor and the 11th floor will be the amenity deck. 1st floor of the parking structure is reserved for commercial and guest parking. The estimated fee will be at $0.69 per square foot, and the fee includes water, sewer, cable and internet. Appliances: Both affordable and market units come with Samsung kitchen appliances – oven, refrigerator and microwave and dishwasher. (Notes: dishwasher is NOT included in studio units) Affordable units will have slightly lower grade appliances of the same brand. 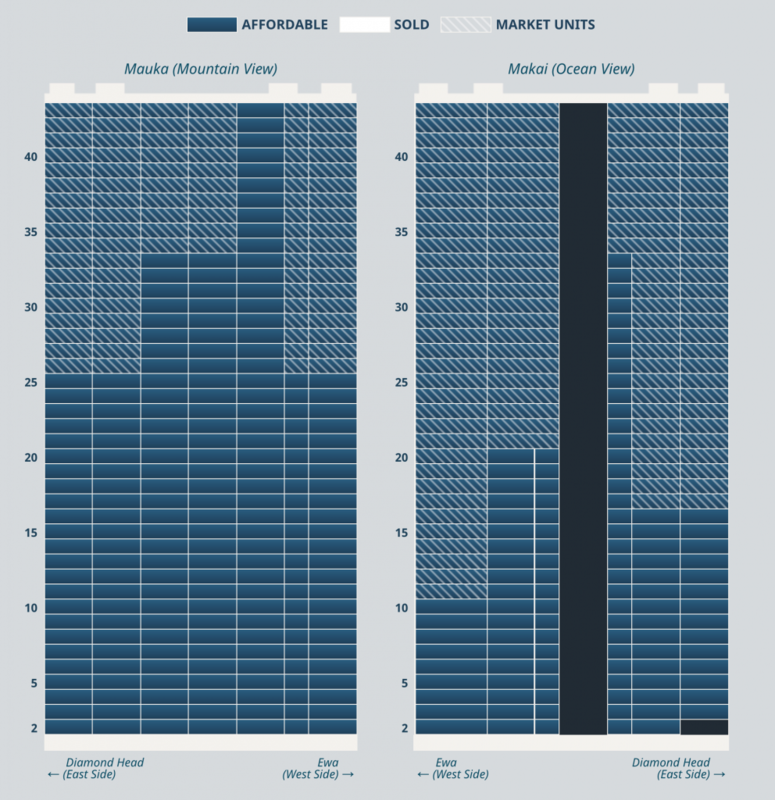 Other than the appliances, both market and affordable units have the same quality of materials. Elevators : 5 elevators and 1 is a service elevator, but it can be used as regular elevator when not in use for service. Service elevator opens both sides (means not only to lobby but also to loading dock). ** disclaimer: information presented on this blog is received and verified by the sales team of the Central Ala Moana, however, it is subject to change at any time. 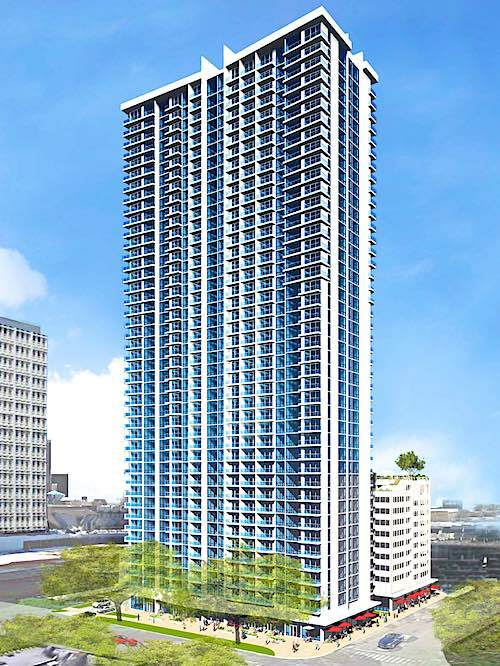 The Central Ala Moana is a new condo project in Honolulu, to be developed by SamKoo Hawaii who is currently developing Kapiolani Residence (expected completion in 2018). Just like Kapiolani Residence, The Central Ala Moana will dedicate 60% of its units as affordable housing, adding more options for Hawaii residents to enjoy the location and lifestyle Ala Moana offers. Some units have amazing panoramic ocean views! The project will be 43 stories high (approximately 400 ft tall) with 10 parking floors including 26 guest parking stalls. 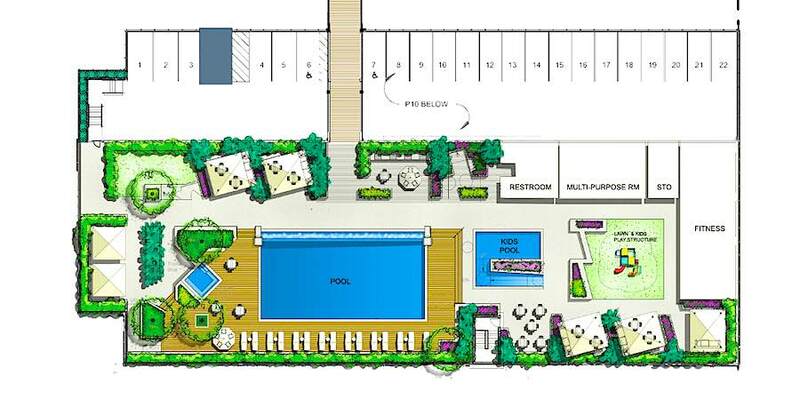 The 11th floor will be an amenity deck providing great outdoor activity options, including; an infinity pool, kids pool and playground, fitness center, recreational center and BBQ cabanas. Parking for Studios, 1-Bedroom and 2-Bedrooms have 1-Parking (Option to Purchase 2nd Stall for the 2-Bedrooms) and 3-Bedrooms come with 2-Parking spaces. Each unit will have high ceilings and upgraded appliances – an induction oven and Samsung heat pump dryer which will be introduced in the U.S. for the first time (just to name a few)! There will be 9 commercial units on the ground floor and each commercial unit will come with 2 parking spaces. All images, renderings are courtesy of SamKoo Pacific, LLC.